After considerable reflection and discussion, we have made the big decision to leave Earthsong Eco-Neighbourhood and move to a smaller environmentally-friendly city apartment. We have enjoyed our four years here and learnt a lot. It’s been a great transition for us from the 28 acres of earthtalk@awhitu, and we appreciate the friendships we’ve established with residents and families both within Earthsong and in the wider Ranui community . However, over time we’ve realised that our lifestyle here has been rather more like our busy lifestyle at earthtalk than we expected – lots of work and lots of people! As we move into our mid-70s (Charmaine has just turned 75, and Tanya will be 72 this year) we want to downsize our housing situation, and shed more of the belongings we brought with us. We also need to step aside from the work responsibilities that are part of a self-managing community- we no longer have the physical and emotional resources to keep on contributing actively to Earthsong projects. In fact, as we age, we rather like the idea of living in an environment that is “being managed”, rather than being part of the management process! We are not in a hurry to leave- when we sell, we are hoping to move to a “green” apartment in the city, hopefully in one of the innovative buildings created by Ockham Developments, where we can continue to enjoy access to diverse city activities and time with friends and family, and maybe have time to do some writing. If you know a family who might be interested in buying a beautiful freehold 4-bedroom home and productive garden in a vibrant co-housing community, please tell them to get in touch with us! 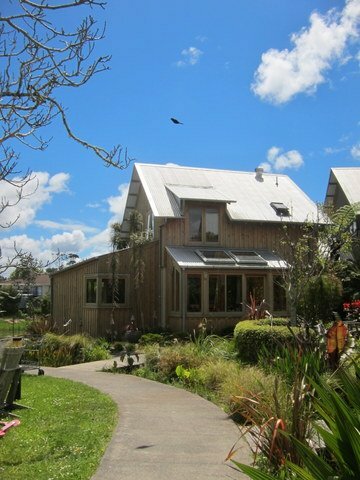 House prices here are not exorbitant (unlike those in much of Auckland), and living costs are considerably lower because of the cooperative and environmental features of the village. Very interesting to get your news. Hope you find a buyer for your property and a great place to move to. I can understand how you feel about the demands of a self-managing community (lovely though it is). So sad you two lovely folk are leaving ES you will be sorely missed. I have really enjoyed my contact with you both and hope that you will stay in contact. Thanks for your message, Megan – I’m sure we’ll stay in touch with our good neighbours at Earthsong ! She has just completed her Ph.D. in Clinical Psychology at Otago Uni and we expect to attend her graduation later this year. Best wishes for your move to a smaller living area. Hi Rob, and Adie- my best wishes to Charmaine, and to Katie and Miriona – as if I could forget your lovely family! Thanks for you message- we’ll be glad to be closer still to the city. More news soon. Hi there. I just came across this the other day and now I see it has been removed from the website. HAs it already sold? dear Charmaine, i’m thinking of moving to Earthsong from a 5 acre property in Coromandel , but i’m 73, may i ask you about the work committment at Earthsong, thanks, naomi..
Its Riko, from Japan remember me? I wolfed at Eartalk maybe 19 years ago and went back a few times with Permaculture Center Kyushu Crew. I was surprised to know you left Earthtalk and started living in Earthsong from Trish last year and now i found you are moving to smaller apartment! I had moved my farmland because of the radiation issue, and now based on my parents house in Tokyo, guerrilla gardening etc. hope to catch up with you! I am publishing Permaculture Calendar in gift economy and its going to be our 17th year . pls check our url! What warmth radiating from your post, your website and the comments. With my toes and fingers crossed, ours with trusting I ask, have you sold up yet? This could truly be the answer to my prayers!! So sorry, Leonie- yes- we sold on December 1 and have moved into an apartment in Grey Lynn- but keep watching the Earthsong website because people do move!